“You picked the wrong place here” - Teresa Treacy to ESB consultant Shane McLoughney, April 2007. On Thursday she was released from jail, still vowing to protect what is left of her carefully nurtured wooded estate from the pylon men and their diggers. Teresa Treacy, a 65 year old woman from Tullamore, County Offaly has been ordered to jail by High Court Judge Daniel Herbert at the request of the state-owned power company, the Electricity Supply Board (ESB). 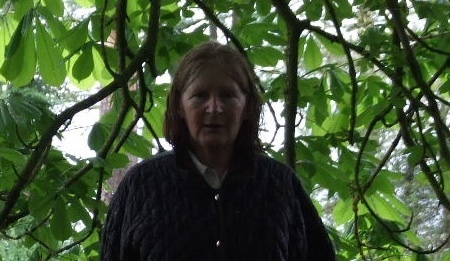 Ms Treacy, who shares the family farm with her sister Mary at Woodfield House, Clonmore, Tullamore, refused the ESB access to her lands in order to protect the natural environment and the native trees that she has managed there for many years. In February 2006 the ESB began plans to construct a 110kV transmission powerline from Cushaling to Thornsbury. The plans specify that double woodpole structures and steel towers accommodating overhead powerlines be built at 200 metre intervals over a total distance of 32 kilometres through the lands of local landowners. 1) The Health and Safety risks, including cancer risks which are increasingly associated with overhead powerlines as a result of Electro Magnetic Fields (EMF). 2) The fact that she has always maintained and improved her land as a natural habitat which includes native trees, old and new, cared for and/or planted by herself for future generations as a sustainable natural resource, through which the ESB want to smash. 3) The fact that the undergrounding of powerlines is now considered to be best practice across Europe. Ireland and the ESB are at the bottom of the league in terms of catching up with international standards and the progress which has been made to ensure that underground powerlines are the progressive way forward. The ESB were also pointed to a recent decision in 2006 to underground the Bantry (Colomane - Ballylickey) 38kV powerline, which arose out of intense local protest opposing the overgrounding of that line. The ESB were contracted to that project by a private windfarm developer who succeeded in getting injunctions against local farmers but decided not to enforce them. He abandoned overgrounding in favour of undergrounding the powerline. When the Cushaling - Thornsbury project was proposed for Tullamore in early 2006 it appeared that there was stiff opposition to the project among the affected 90 landowners in Offaly. Undergrounding options were discussed as technical possibilities and European best practice had come to the attention of the public. It’s one thing to have a private developer opt for undergrounding but the ESB, fearing that a precedent may be set, were clever enough to use the Irish Farmers Association (IFA) to negotiate a compensation package with the landowners, most of them farmers. Teresa Treacy stood to gain up to approximately 150,000 euro in 3 staged payments if she agreed to the project and on condition that no legal costs were incurred by the ESB if they had to go to court, in which case the last 2 payments would be ‘forfeited’. This deal, negotiated by the IFA over the course of 2 years, seemed to appease most of the landowners so by the time a public meeting was called to organise the landowners, by Ms Treacy in March 2009, less than a dozen people showed up. By the summer of 2011 Teresa Treacy was the only one refusing access to the ESB. The ESB has made a number of applications to the High Court over the summer, including orders for Ms Treacy to unlock her gates and let them in and subsequently an order empowering the ESB to break the locks after Ms Treacy refused to obey the first order. The ESB told the court that Ms Treacy “has an emotional attachment to her trees”. When Ms Treacy obstructed them from breaking the locks the ESB decided to go back to court to issue contempt proceedings against Ms Treacy. On Monday 12th September 2011, Judge Daniel Herbert told Ms Treacy that he had no choice but to uphold the law and ordered that she be jailed for contempt of the court orders. “I’m begging them for years” said Ms Treacy. “5 years, what a waste of time it was trying to talk to them”. Facing jail she said “I feel good, I really do. I just couldn’t let them in to do that. It’s just not right”. “We already have 10 ESB poles on our land and feel that we have already done enough for the common good. Our farm is our life’s blood, its scenic beauty from the untouched fields to the river and through the bog, all of it natural flora and fauna”. Earlier court proceedings were heard by Judge Mary Laffoy who granted orders to the ESB. I’m wondering did Judge Laffoy decide not to be available to the ESB to hear contempt proceedings. Who would want to send an elderly woman to jail in these circumstances? When judgements are made in the High Court they are usually presented as ‘ ... the High Court has ruled such a way ...’, and the name of the judge is understood to be irrelevant for the purposes of law. A judge is simply an instrument of the law and the law must be applied regardless of the personality or opinion of the judge. It is legally correct for a judge to take responsibility for ‘difficult cases’ because that’s their job, and regardless of good reason, and the 3 reasons outlined above, the law must be applied, mustn’t it?! Ms Tracey said she was “very, very relieved” to have been released from prison, following an appearance at the High Court on Thursday. Her release came despite her refusal to purge her contempt of court, after 24 days in Mountjoy jail. In her absence, and before action could be taken to avert it, her family permitted work to go ahead. Sadly, between 80% to 85% of the trees she wished to save were cut down. A spokesperson for Ms Treacy indicated she may yet appeal to the Supreme Court the underlying orders that allow the power line to be erected on her lands. She remained defiant leaving court this afternoon. “No I am not letting them through. I’m not letting them through the land,” she said. “I will never let them through.